I was not really excited to go to Timisoara at this time of the year because of the cold weather, but the perspective meeting good old colleague-friends kept me warm. We came together for a doing2learn project meeting, sharing our work we have done, difficulties we had and still have and discussed how to proceed. I have done these European projects since seven years now and it is very often quite disenchanting and frustrating. There are many players in the ring with different motives which are not always conform with the meaning of the project or the European framework. Mostly, those people who created the project and carried out the work are enthusiastic at the beginning, trying to bring fresh ideas into their organisations and trying to motivate people to broaden their horizon by learning something. This is the wonderful, idealistic view and seldom realistic enough. The protagonists are often left alone with the work, don’t really get support from their institutions, enough time, staff or management capacities. The money they bring in with the project is the only thing that counts. So in our project, there are three partners which suffer from a lack of help from their institutions. This causes lots of difficulties not only for them, also for our project work. Somehow we will get the work done with good results (I hope) because the persons involved are believing in the idea of the project and the European education programs. It is a symbiotic construct: the contracted parties are the (big) institutions, they give their name and use the involvement in such projects as advertisement for the institution. The project work is carried out by single persons who act independently from their companies as long as they do not ask for the project money. As a result, most of the work is done outside their normal working hours, because they often can’t do project work during their normal working hours because of their contracted activities. In a long perspective, this situation leads to demotivation and work overload. That’s ironic, it can’t be in the interest of the European program. This situation is one reason why we have difficulties in our project group, some of the partners get no or very low support from their own institutions. They don’t want to make it public and therefore, the other partners, wondering what’s going on, become demotivated too. The recent meeting was a good opportunity to clarify that situation. We are honest and open enough to be able to discuss that, but I am not sure, if that will go into the official reports for evaluating the project. We have great people on board in this project and that meeting in Romania imparted to me another view of the country. Our host was the Association for the Promotion of Women in Romania (ApoWeR), established in 1999. The biggest, and most spectacular result of their work was the legislation of a law against domestic violence. They run lots of educational programs for women of all ages. Meeting their doing2learn group was a very emotional and motivating event! As always, I did not have much time to go around for sightseeing, just an hour per day. Even though it was cold, snowy and grey, I could foreshadow the old glory and richness of the city in the 19th century. 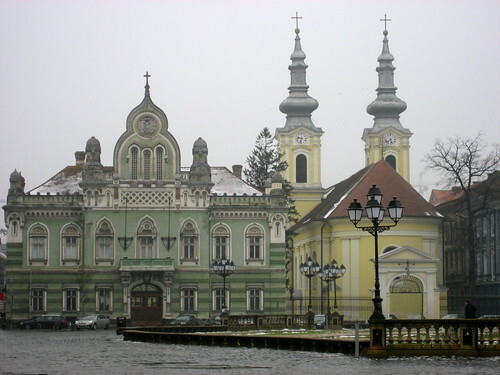 Timisoara needs a lot of money to restore, educate and skill people to develop their city. The effort is worth it, no question. They are great people!